2 December 2011, at 10:53a.m. 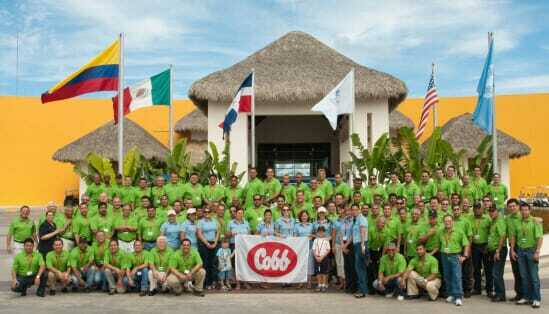 DOMINICAN REPUBLIC - More than 90 participants from 30 customers in eight countries took part in the second annual North American technical seminar organised by Cobb and their Caribbean distributor Cobb Caribe in Punta Cana, Dominican Republic. The three-day event, bringing together delegates from Canada, Mexico, Central America and the Caribbean, was structured similar to the annual Cobb world technical school held each May in Siloam Springs, Arkansas, USA. Each day of the seminar was dedicated to a specific topic that included an industry overview, an R & D update and information on breeder, broiler and hatchery management. Joining members of the Cobb technical team as speakers were prominent industry experts including Mike Donohue from Agristats, and Dr Susan Watkins and Dr Keith Bramwell from the University of Arkansas. Antonio Bucheli, production director of Pilgrim's Mexico, expressed how valuable delegates had found the event. "It is not easy top find an event with specialists so knowledgeable in each area like the ones we have seen in this seminar," he said. "This adds great value because we can really get the most out of the talks." Ken Semon, Cobb director of technical service for the region, said the seminar was 'a huge success.' He commented: "I was extremely pleased with the excellent participation from our growing customer base in this region. This seminar not only serves to deliver the most current technical information to our customers, but also creates the perfect setting for customers to interact with each other." Heath Wessels, director of sales for the region, added: "The programme presented over the three days was very well received and the enthusiasm I felt from the group made me proud to be a part of the Cobb family."